Various software testing and project management methodologies have grown in popularity recently. While most of them rely on long term planning, agile methodology uses a rather unorthodox approach (or at least it was unorthodox a few years ago). The success testers and project managers achieved with agile in the recent years proves the efficiency of the approach, which results in an increasing demand for project managers and software testers who can apply agile methodology in their work. In what does the agile testing (development) methodology differ from the other testing (development) methodologies? Can we apply agile methodology to other areas and projects? Main characteristics of agile methodology? Describe a situation when you used agile methodology in your work, or when you belonged to the team that applied it successfully in a project. Anytime applying agile methodology, the testers (developers) ensure that the whole process of testing (development) is broke into as small steps as possible and just a small unit of code is tested (developed) in each of this steps. The team of testers (developers) is communicating consistently the results of their work, and change the short term strategy and even the development plan on the go, based on the results of their testing. Agile methodology encourages flexible and rapid response to change, which should lead to a better end result. Employers try to understand if you see the real benefits of agile approach, and the practical application for various areas of their business. To say that the methodology can be (and perhaps even should be) applied anytime we have insufficient entry data, or when we work in an unknown area, or simply within a small team, or when many unpredictable variables play the role in the final outcome, would be a good answer. Bio-medicine, biochemistry or physics belong to the fields where we apply agile methodology ever more frequently, and achieve good results doing that. Every person can approach the question from their own view, and perhaps a software tester would give a different answer than a project manager would. Nevertheless, you can list cross-functional team composition, face-to face communication, solving problems immediately after they are identified, and working solution as a primary metric of progress, as the main characteristics of agile development. Mention the situation, the challenges you faced, and how agile approach helped you to successfully achieve your goal. Try to talk about team work, and about the end result of your effort–and how it benefited the employer, or the final product you worked on. If you can not find anything to talk about from your professional career, think about something from personal life–though we do not typically realize it, we apply agile methodology in many everyday situations and interactions with other people. Such a creative answer can easily win you a favor of your interviewers. Describe Product backlog & Sprint Backlog. Explain the main difference between traditional Waterfall model and Agile testing, in a simple way. Describe the principal difference between Burn-up and Burn-down chart. What do you know about a story point in Scrum? What do you mean by the X and Y axis of the burn down chart? What do you mean by sprint retrospective meeting? What do you know about Kanban? What are the most important agile Matrices? The old times when a technician had to know only their field of expertise (and nothing else), are long gone and forgotten. Everything relates to everything, and you won’t be an isolated unit in the company (or even in your small team). Hiring managers are well-aware of the fact, and they try to hire people with decent communication and social skills, people who have the right attitude to work, and to their colleagues. Describe a conflict you had with your colleague. Why did the conflict pop up, and how did you react to the situation? Describe a situation when you went above and beyond with your service (for the customer, for the colleague in your team, for someone in your personal life). Describe a situation when you reached a goal and tell us how you achieved it. Or the questions can go like this: Describe a time when you failed to achieve a goal, and try to explain why you failed, and what would tyou do differently the next time. Describe a time when you had to deal with an angry or upset client (customer, colleague, anyone). How did their attitude affect you? Describe a situation when you did not agree with the opinion (or decision) of your superior or supervisor, and knew that they were wrong. How did you handle that? Did you respect the line of hierarchy, or did you follow your way? Describe a situation when you faced a particularly demanding problem or challenge in your personal life. Did it affect you negatively in your work? How did you manage to overcome this crisis? Describe a time when you struggled to communicate something to your boss, colleague, or to a customer–for example a complex technical issue or a problem that exceeded their knowledge. How did you manage to get your message over? Special tip: Many technicians struggle greatly with behavioral questions, and fail to succeed in an interview because of their struggles. If you are also not sure about your answers to these questions (or do not know at all how you’d answer them), have a look at our Interview Success Package. 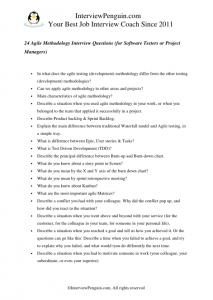 Great answers to fifteen most common behavioral questions, and other useful resources, will make your life much easier in your agile methodology interview. What to bring to the interview with you – Learn what documents and materials you should take to the interview with you, and how to present them to the employer. Agile methodology course – Free course from Udemy, good to take it if you are just starting, or if you need to polish your theoretical knowledge of the field. 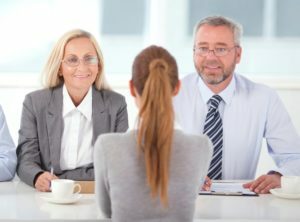 15 most common interview questions – if you interview for a job in an agency, or if many people apply for the same position as you do, a first, screening interview, will help the employer to shortlist the candidates for next stages of the hiring process. Agile on Wikipedia – Good article summarizing the basics of agile software development.